Nuclear is a free Electron-based program for desktop operating systems such as Windows, Linux, or Mac OS X to stream music from popular free sources on the Internet. The music app is not just another program to play streaming music; what sets it apart from dedicated music players like AIMP or Winamp is that it puts a lot of focus on presentation and information. The program is available as a pre-alpha version at the time of writing; this means that you may encounter bugs when you run it and that some features, charts for instance, are not available yet. The developer plans to integrate local playback capabilities at one point in time among other things. You have a couple of options when you start the program. Use the built-in search to find artists or songs of interest, browse genres and suggested songs, or check out the news section which lists new or popular albums and artists. The app taps into YouTube's, Bandcamp's and SoundClouds's vast music archive to deliver the music to the desktop system, and Discogs' and Last.fm's music databases that powers the informational part of the app. Right-click on any song to add it to the queue. Playback starts with a click on the play button, and it is near instant. The usual options to repeat, loop, pause, or skip are available. Songs may be saved as playlists to load them again at a later point in time. Search may return artists and albums. A click on an artist displays photos, popular songs, tags, similar artists, and a list of released records. Nuclear displays a list of popular genres, e.g. Pop, Jazz, 80s, or Hard Rock, that you may browse. Genres list popular artists and songs that you may look up in the app or add to playlists. You may notice that some songs are placed in a genre incorrectly, e.g. placing a Rihanna song in the Trance category or Lady Gaga in the Japanese genre listing. Most listings appear accurate, however. Another issue that you may run into while using the app is that it is not possible to add multiple songs to the queue at a time. You cannot just click on an album and add all songs of it to the queue, nor can you do that in genre listings or search results. An option to do so would certainly improve usability. The lack of a back button is another issue that exists right now. It is likely that these will be addressed at one point during development though. One interesting feature of Nuclear is that you may change the source for a track that is in the queue. The default source is YouTube, but you may switch it to another source, e.g. Soundcloud. Tip: you may change the default music source under Plugins. The settings let you connect to Last.fm to enable scrobbling, and enable compact styles for the menu and queue. Nuclear could become a free Spotify alternative for desktop systems; the pre-alpha version is promising and the developer has plans to expand the features of the application. Planned features include listening suggestions, country-specific top lists, browsing by popularity, and realtime lyric support. The program has a couple of usability issues and artist/genre association issues. Playback works really well on the other hand. Now You: Do you use a dedicated music streaming app? What is your take on Nuclear? I don’t want my music to be radioactive. 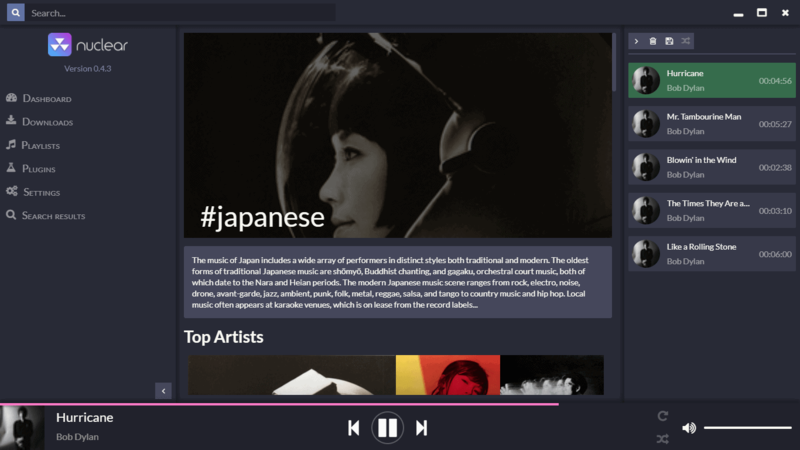 So it taps into free music sources, yet it doesn’t even include Jamendo? Fail. You can “tap into” Jamendo like the other services though. All the content offered by Jamendo is covered by a special license called “Jamendo license”. Its not like youtube, Soundcloud or bandcamp. Dark grey background a bit less grey sidebar text isn’t too easy to read, had to turn by brightness up more. Tried it for Nancy Sinatra Bang Bang and there’s a big difference in quality between youtube and soundcloud. I assume that’s going to depend on the individual song. Would be nice for it to work out which was better quality and use that, as it is you select the source in settings. Even putting the toggle in the main interface would be an improvement. Yes, usability improvements are needed to make this better. Sounds like a great idea… until I saw it is an Electron app! Whilst I don’t like electron apps over much smaller and often faster native apps the other way of looking at it is would the app even have been created otherwise, or if it would have then been, would it have been cross platform. In most cases it probably wouldn’t have been. @Anonee: I had the same reaction. Fully agree. If it’s electron it can go to hell. It’s huge, slow, and security nightmare in one. Rather be without a program than have a messed up electron based one. It works seamlessly by aggregating music from different sources on the internet. Still enjoying Spotify after having tried the individual apps online. Those never stuck w/ me. 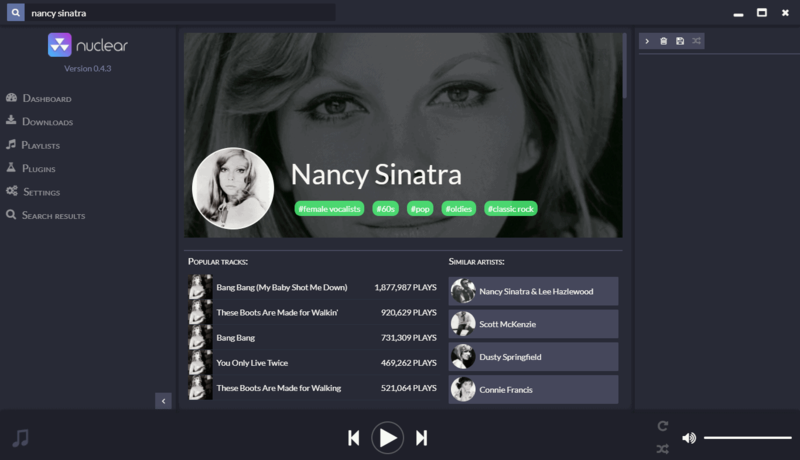 That tubeats site mentioned by Amaury looks very promising since has the look-feel of Spotify. Jamendo looks hipster from landing page vs tubeats. yrmv. Thanks for the Nuke review but given its “user test me” status that’s a no for now. recent news reports about Gaga being in Tokyo. Put 1 + 1 together and came up with 3. You may notice that some songs are placed in a genre incorrectly, e.g. placing a Rihanna song in the Trance category or Lady Gaga in the Japanese genre listing. Most listings appear accurate, however. OMG….Justin Bieber is in the “Black Metal” list. Has he gone to the dark side now?